Recently we called on drum corps fans to "spread the word" about drum corps to the uninitiated invited longtime fans to become marching music evangelists. Chrissy Hammond sent in this pic. 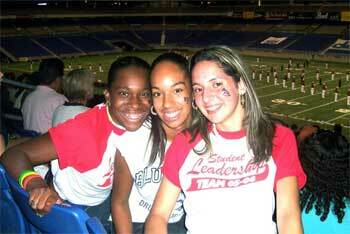 "This is a picture of me (on the right) with my best friends Candace (left) and Kristina (middle) at the DCI Southwestern Championships this past weekend in San Antonio. All three of us attend Judson High School and are in the marching band there. I had gotten a large group together to go to the show this weekend. It was awesome having 34 people there from Judson, and it was also even better knowing that most of them had never been to a DCI show before. Anyway, this was Candace's first show, Kristina's second show, and my third. I think I turned Candace into a new convert. We are all definitely planning on attending the show again next year, and hopefully I'll be marching pretty soon." Thanks Chrissy! We're asking each of you to reach out and spread the word about the drum corps activity. Knock on doors, e-mail, instant message, even yell if you have to -- but this is the summer for you to bring a friend to a DCI show. Bring a digital camera to the show and take a picture with your new drum corps convert at the show, and send it to dave@dci.org -- we'll post pics as they come in under the headline, "New convert." Great seats are still available at most DCI shows. Pick up the phone, make your pitch, and we'll see you on the 50.